Clearly when most people imagine their kids or grandkids playing in their own playhouse it is some kind of huge wooden playhouse like you would see on TV or in a movie, but if you do not have the budget or most likely the space for something like this, then there is always a more practical plastic playhouse. Plastic playhouses are very low maintenance, can take a real beating and they are in most cases a far cheaper option. Today we are looking at the most popular playhouse retailers in the UK and while most of these do specialise in wooden playhouses, we still managed to find some incredible plastic playhouses and are going to let you know what sites are have the best selection and what ones are easy to use. have a great mix of playhouses for boys, girls and ones that would be ideal for both as well. 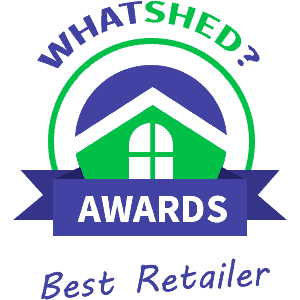 We just love the choice that Shed Store are giving you and the fact that they are priced very fairly is also an attractive quality. In all this is by far the first place you want to go to when it comes to looking for a plastic playhouse as to be honest they really do not have a rival. no trouble finding their plastic playhouses at all, but we did have to use their search engine. They give a good and easy to follow description and they have some lovely pictures that let you visualise how much fun your kids are going to have with their new playhouse. , sand pits and other things kids love to have fun with. One thing that we really like is how all of these outdoor items are based in the one section on the site. If you want to really make your garden a kiddie wonderland, then Taylors Garden Buildings have all you and your kids could possibly want. your heart set on then you are going to love how Buy Sheds Direct have playhouses that come with a high quality plastic slide – we feel that this gives you the best of both worlds as you have that classic looking wooden playhouse, along with the fun and modern plastic slide. the past so it is safe to assume that they will stock them again at some point. Garden Buildings Direct do actually have an incredible selection of wooden playhouses for you to browse if you cannot wait or should we say if the kids cannot wait for them to get plastic ones back in stock. as they do stock a few playhouses that have plastic features and a plastic slide. So while you cannot get a playhouse made from moulded plastic here, we do feel that they are offering the next best thing. The way Waltons explains what makes each playhouse special is something we really like about their site. that the kids can have fun with such as a really smart looking sandpit. While they do not offer a traditional plastic playhouse, we feel that the selection of other types of playhouses that they have makes them well worth a look. retailers, we still think that their vast selection, ease of use and detailed descriptions of the other styles of playhouses that they do have makes then worth checking out. not known for their speedy delivery times or customer service. your garden, a playhouse is not one of them.